Thanks, Mail Carrier | Driving versus Flying: How do you travel? Somehow August has ever so sneakily arrived around here (does anyone remember May? Because I'm not convinced that it actually happened) and it seems that everywhere I turn I'm hearing about vacations. Beach vacations, camping vacations, staycation vacations, and more have been bringing fun to families across the country and will continue to do so until school starts up again in the fall. 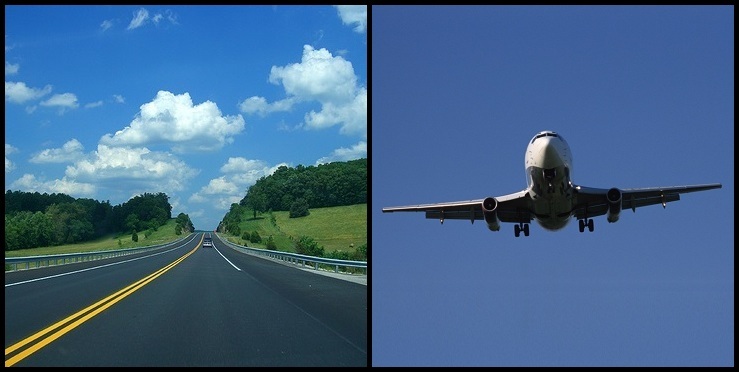 However, aside from the staycations, most every vacation requires some sort of travel - mainly driving or flying. Personally I'm a fan of... well, neither. Driving doesn't require quite as much pre-planning and will most likely save money, of course. Even if you factor in a car inspection and the cost of gas, you're pretty much guaranteed to have quite a bit more money in your pocket when you arrive at your destination. If you're a road trip type of person, you probably enjoy packing up snacks, drinks, your favorite music, movies or games for the kids, and whatever else is needed to pass the time. You also might spending time putting together a fully mapped out trip, including stops along the way, all planned out. Finally, you even might like the actual act of spending hour upon hour in the car seeing the wonderful scenery, visiting unique stops and being able to get out and stretch your legs, and in general experiencing a great deal of our beautiful nation. I don't really enjoy any of that. Flying has the major benefit of getting you from Point A to Point B in a fraction of the time. Even when you factor in getting to the airport early, all the horrible time spent in lines and security, you're most likely able to get started on your vacation that very day. If you happen to be someone who is flying sans-kids (or with very well-behaved ones) and are a relaxed passenger, you can sit back and enjoy the time spent on the plane. Eat, sleep, read a book or a magazine, watch a movie, and voilà! You're there! Not only that, am I the only one who didn't know how much safer flying is compared to driving? Due to how much more of a big deal is made over each airplane crash, I guess I never realized that your odds of something happening are SO much higher when you're in a car. Add that in with the shorter travel time and no wonder people enjoy this mode of transportation. Nope, not a fan of flying either. Unfortunately, unless I'm going to start traveling by train or bus, it seems that my options are back to flying or driving. Even though flying costs more money, gives me motion sickness, causes internal panic over every new security regulation and makes my brain race with thoughts over missing my flight, it still wins out in the end. How those of you who enjoy road trips can handle that many hours in the car, I'll just never know. I like to drive for shorter trips but when it goes past 6 hours...FLY! It really depends. I love road trips, but it takes too long to drive sometimes. I'd love to get a van and drive to Florida, but I don't want to waste vacation days on driving! Well, I like how fast it is to get there with flying. But it still scares me. Driving is fun because I like road trips, but it can just be so long! It depends on where I'm going. I usually drive if it's within a few hours, but if I'm flying out to my best friend's on the (almost) West Coast, I fly. I used to drive to and from Florida, a 12 hour drive, because flights at the holidays were astronomically priced. It always took two days because the traffic would be terrible. I hated it and so I moved back home so I wouldn't have to drive those long trips anymore. I guess I'm saying I prefer to fly long distances. I hate cars. Hate them. I'd much rather fly. Yes, there are some downsides to flying, but to me they don't outweigh the downsides of driving. As for the costs, you have gas and other consumables like oil and tires, tolls (which just went up again in our state), motels, extra meals in not so savory rest stops, and extra snacks for the car. I'd rather be at my destination sooner and get on with my vacation or whatever. And it is, indeed, much, much safer to fly. A million people a year die around the world in car/truck accidents. That's a lot of people. I prefer flying. But I do drive once a year to Idaho with my dad. The drive takes between 14 and 16 hours. Ick!